The effects of a supernova -- and possibly more than one -- on large ocean life like school-bus-sized Megalodon 2.6 million years ago are detailed in a new article. "I've been doing research like this for about 15 years, and always in the past it's been based on what we know generally about the universe -- that these supernovae should have affected Earth at some time or another," said lead author Adrian Melott, professor emeritus of physics & astronomy at the University of Kansas. "This time, it's different. We have evidence of nearby events at a specific time. We know about how far away they were, so we can actually compute how that would have affected the Earth and compare it to what we know about what happened at that time -- it's much more specific." Melott said recent papers revealing ancient seabed deposits of iron-60 isotopes provided the "slam-dunk" evidence of the timing and distance of supernovae. "As far back as the mid-1990s, people said, 'Hey, look for iron-60. 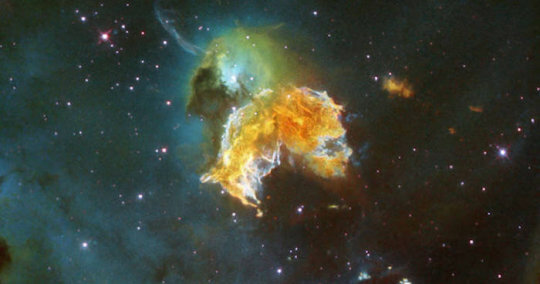 It's a telltale because there's no other way for it to get to Earth but from a supernova.' Because iron-60 is radioactive, if it was formed with the Earth it would be long gone by now. So, it had to have been rained down on us. There's some debate about whether there was only one supernova really nearby or a whole chain of them. I kind of favor a combo of the two -- a big chain with one that was unusually powerful and close. If you look at iron-60 residue, there's a huge spike 2.6 million years ago, but there's excess scattered clear back 10 million years." Melott's co-authors were Franciole Marinho of Universidade Federal de Sa?o Carlos in Brazil and Laura Paulucci of Universidade Federal do ABC, also in Brazil. According to the team, other evidence for a series of supernovae is found in the very architecture of the local universe.